I described some of our recent research, which looks at automatically mining user opinions from the plentiful product reviews that are now available on many sites. These reviewers provided a wealth of information on many different features of the products, far more features in fact than would normally be available in conventional catalog-type descriptions. The nature of these opinions is of particular interest to us because they capture the opinions and experiences of real users. These feature convey not only whether a hotel, for example, has in-room wifi but whether it was fast or slow, cheap or expensive. This allows us to create experiential recommendation systems to provide users with more informative suggestions for products and services that may suit their particular needs and preferences. As I was writing the post I came upon a very timely article on Wired describing Flickr’s Camera Finder Tool (CFT). This tool uses the Exif meta-data from millions of photos to provide a analytics tool across a wide range of digital camera. Exif data is the data that your camera stores with your image file, capturing a wealth of information from technical camera settings (ISO, aperture, speed etc) to device, time and location information. 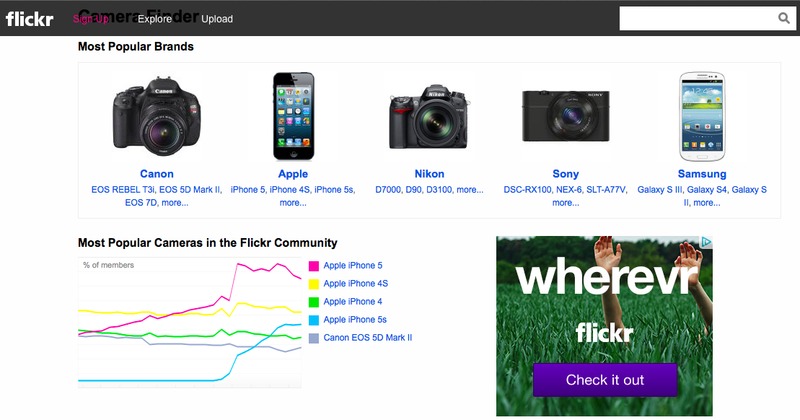 The Flickr CFT uses this information to, for example, display charts of the most popular devices and brands currently in use by Flickr users; Apple’s iPhones are winning out big-time apparently. But the real fun starts when you click on a particular camera. Doing this brings up a page of images, taken with that camera, along with a a search box where the user can provide more detail on the type of usage they are interested in. Looking for a camera for taking night-time shots then search for “low light” to see actual low-light images taken with the selected camera. The point is that these images are experiential. They are the result of real people using the real product. They allow the users to gain a much better understanding of the product than would be possible using technical catalog data alone. The CFT is pretty simple at the moment. I couldn’t get it to work with multiple features/tags and it didn’t allow me to easily compare cameras. For example I would like to be able to select a few candidate cameras and compare their low-light images or the portrait capabilities or look at their landscape outputs. Even better, since images have ratings and click-through data, it may be possible to algorithmically rank camera output by the ratings of their top-rated images (assuming that the image sample size is large enough to remove any bias in the skill-levels of the photographers). Many images also have comments. It should be possible to mine these to extract further information about the quality of a camera; for example if many people comment on the visual noise or artefacts in one camera’s low-light photos then this can be surfaced for the user. Once again it’s all about the experiences of real people and capturing these experiences in a discovery or recommendation setting. Flickr’s CFT works because photos and meta-data are a rich source of “camera experiences“. As we move towards the Internet of Things I wonder what other types of experiential data will we find in an ocean of sensor data? As an intriguing example, a few tweaks to a running app like RunKeeper could allow a runner to enter the brand and model of running shoe and provide post-exercise data on sore spots or injuries. By mining this data for correlations between running shoes, skill levels, distance, speed, terrain, injuries, enjoyment etc., RunKeeper could very well become a unique source of running shoe recommendations, or other gear recommendations. For example, as a 85kg male in his early 40s, who likes moderately paced 20km runs over varied terrain, RunKeeper could help me identify the shoe that might best suit me by looking at the products that elicit the most positive feedback from similar runners among its millions of users. If I have a niggling ITB injury then it might even be able to identify those runners who have managed to overcome a similar complaint and look for patterns in their running shoes; perhaps I should avoid minimalist footware, for example, or go for a more structured, supportive shoe. I think that there are some really interesting opportunities on the horizon for a whole new generation of product discovery engine based around these and similar ideas…Stay tuned!